The cartoonist and illustrator Tom Gauld is well known for his Guardian cartoons, especially in the Saturday review pages. One of his more popular items appeared on the 9th June this year; entitled ‘My Library’. This inspired my friend Chris from Calmgrove to take the idea and write his own list based on Tom’s categories. Chris is in the middle of downsizing his book collection, as am I. I loved reading his answers and asked if I could steal the idea. Chris was only too happy to share. If you haven’t read Calmgrove, go over and check his site out. Not only is Chris an amazing book reviewer, he will introduce you to books you’ve probably never heard of but should. 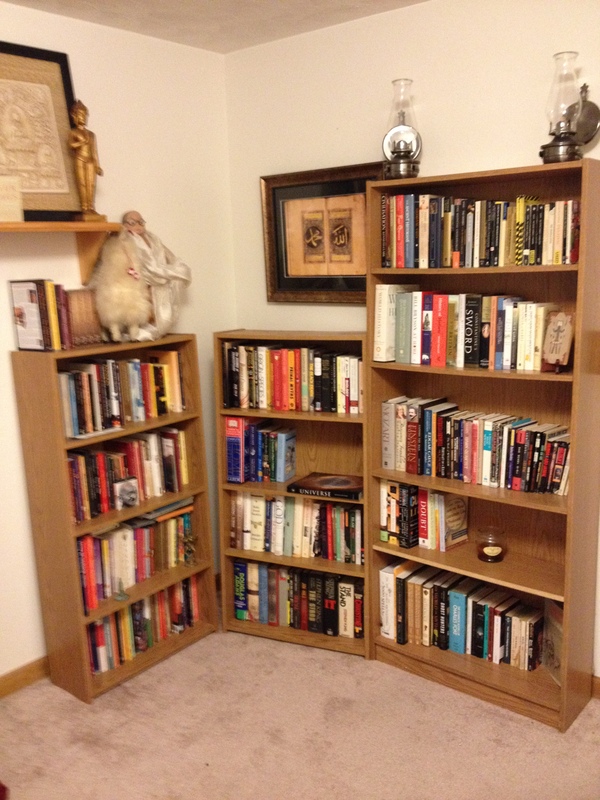 I am not so much downsizing as I am getting rid of books in order to make room for new ones. It’s a shell game. Between amassing a huge collection of medieval books (it’s starting to look like the British Library over here) science, religion, philosophy and for the last three years, Shakespeare related books, I am feeling rather squeezed in. Books are starting to show up in some rather inconvenient places. I’ve begun the painful process of trying to decide which books must stay and which ones I can live without. Last night I learned a valuable lesson on how to do this. 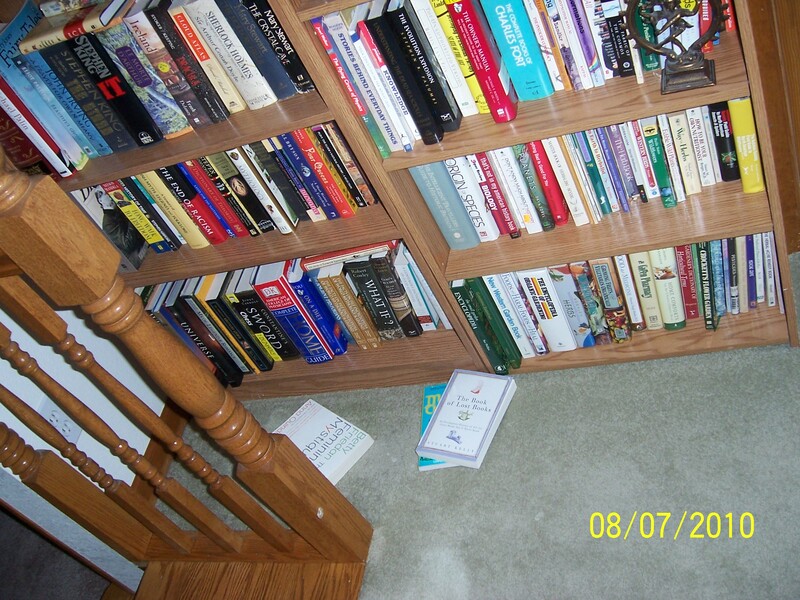 Simply remove all books from the shelves, clean and move the shelves then start the process of reshelving. Trust me, after an hour of sorting and moving books, you quickly find out which ones you don’t want to spend another minute on. Though painful both physically- I dropped a shelf on my foot- and mentally my efforts were rewarded. I now have a small library in the spare bedroom, though this is only a fraction of the books I own. Sigh..this is going to take awhile. To this! And yes, this is the “Dolly Llama” on the left. I’ve read the majority of the books I own. The reason I keep them is because most are used for reference. And as I could not possibly remember everything I’ve read, my nonfiction –which are most of them- sit collecting dust just in case I need to refresh my memory. It amazes me how many have come in handy for college papers. I have an almost up to date master list housed over at Librarything. This list says I own over 600 books marked as “Read”. Considering it is not quite up to date, I’d move that closer to 700. I never did include my college texts and old novels. Here in lies my overflow problem. I have a bookshelf dedicated to books I need to read as well as books housed on tops of shelves. Last year I figured out it would take two books a week to turn these into Read books. But as I keep adding to the pile, it’s now going to take three or four a week. I really need to turn the cable off. Full disclosure, many of my half-read are in my Intending to Read list. If a book is half read due to it being bad, it is easy to get rid of. But, if I think I may come back to it (yeah, sure Sari) I keep it. I cannot imagine pretending to read a book. But then again, I am a terrible poker player. My luck, if I said I read a certain title, the other person would be all set to talk about it, in great detail! This category goes hand in hand with my half-reads. Sometimes I realize I am not giving a book my full attention, so back it goes for when I have time. If I could get myself to admit that many of the books on my Intending to Read shelves will never be read by me and just give them away, we’d all be the better for it. Coffee table books count right? I’ve got a few books on famous painters sitting under my glass coffee table. The books on this shelf are for show, but I have read them. That doesn’t count, right? Just makes for good conversation with the right people. Refer back to my answer as to why I keep so many of my Read books. I am certain, over the years there have been many books I wish I hadn’t read, especially when I was a copy editor, but the one that jumps out is Twilight, but this book stayed in my house a few days. After that I had a priest, a shaman and a rabbi come over to cleanse my house, because I couldn’t figure out what possessed me to read that rubbish! There are days when I still feel the urge to bleach my eyes. I very much like your take on the mirror Gauld forces us to hold up to our hoarding — er, collecting — nature, revealing those little half truths that we hold and pretend reflect reality. Ooh, and your “related” links, after your post, they look interesting! I often go exploring a blog from these links, though I don’t know anybody else who does or admits to it: a great WP feature, I think. Funny, this is one of the few times I can see which related links WordPress picked. I agree, I do like the feature and sometimes find some gems when I dig through them. So far I have three boxes of books to donate to the library. Isn’t it funny how our book collection reflects our inner workings? Once after a fun third date I was invited over for dinner. 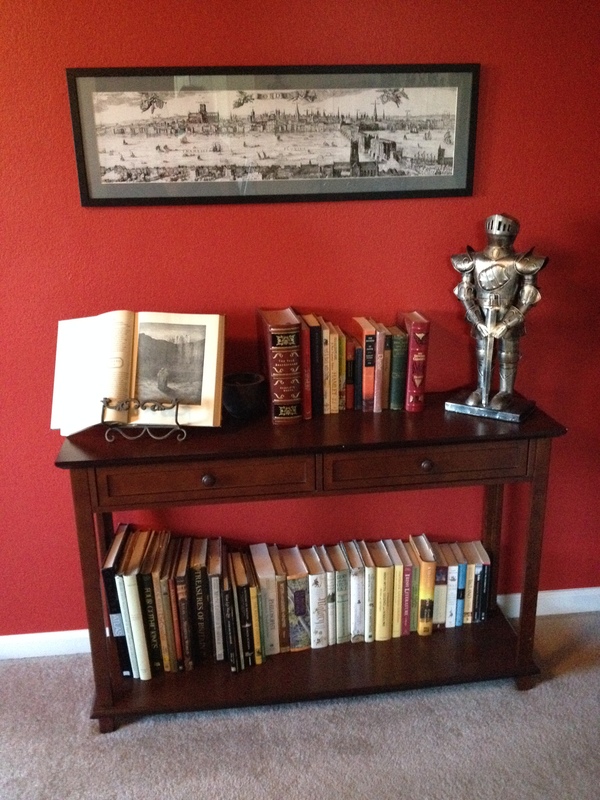 I marveled at his book collection as many of the books I had read and enjoyed. They were all science books so I started to talk about them and the authors who wrote them. To my surprise and dismay the man quickly admitted all the books were for show; he wasn’t a reader at all. This turned me off, was he just a phony? What else was just for show? It was our last date. It’s about that point in the bookweeding that I go look at what my local used bookstores are buying. And then for the decisions. Do I need two copies of Plato’s “Protagoras?” Is that book on the last witch burned in Ireland in the 19th century a keeper or will I ever even think of it again? I think the most painful bookweeding ever was when I left to go for my Ph.D., and got rid of certain books which I had never read, and had finally realized they belonged to a part of my life that was over and never would be read. Your comment really hit home. Books become artifacts of our lives, don’t they? This is why I’m having such a hard time with certain books. They are the last remnant of my younger self. Letting them go is as you say, a realization that that part of my life is over. Ironically the books that have the biggest hold over me are my books on Easter religion. I spent 15 intensely studying and practicing Buddhism. And though the guiding principle of Buddhism is “to let go”, these are the ones that I struggle with. I might feel better if I knew of a place to take them, but here in Carson we lack both a used book store and Buddhist temple. These, I may tackle last, but I am determined to at least get rid of some. Okay, maybe 5 ? Do you mean to tell me that this guilt I bear over not finishing certain books and not getting to certain books in a reasonable time, is pure self-imposed lunacy? I’ve been racked by this awful feeling that I’m somehow letting someone down by not fulfilling my literary responsibilities. Though, as we both know, sanity is not familiar to me. Perhaps I should just do as I damned well please. No, my dear friend. You are in good company. Many of us have those books that we just couldn’t get into but yet, will not let go of. Yes, do what you will with your library. It’s your library after all!